After the last few weeks of exploring the River Thames and beneath the city streets, this week it is time to return to London in the late 1940s. This is my father’s photo of the Lamb and Flag pub in Rose Street, near Covent Garden, taken in 1948. The name Lamb and Flag can be seen just above the entrance to the Saloon. On many London pubs of the time, the name of the brewery was given much greater prominence than the name of the pub. 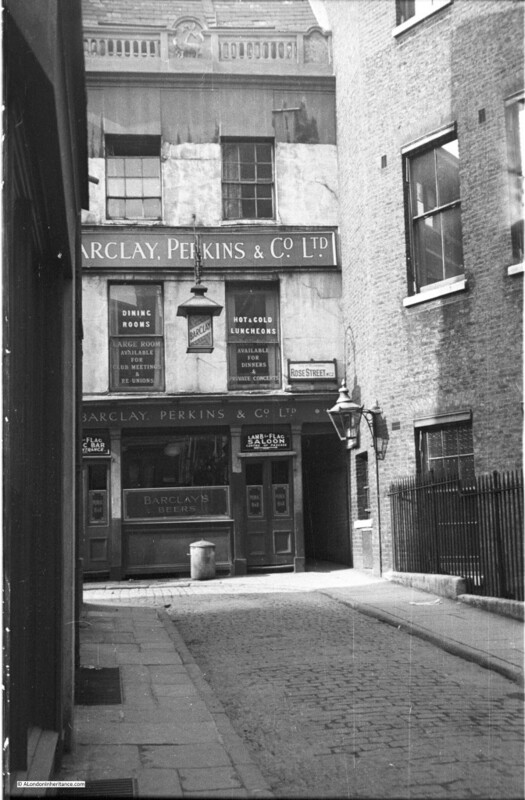 Barclay, Perkins & Co. Ltd were a major London brewery operating from the Anchor Brewery in Park Street, Southwark. The brewery was originally founded in 1616, becoming Barclay, Perkins in 1781 when John Perkins and Robert Barclay took over. Barclay, Perkins merged with Courage in 1955 and the brewery closed in the early 1970s. And my photo of the same pub from the same location 67 years later in 2015. 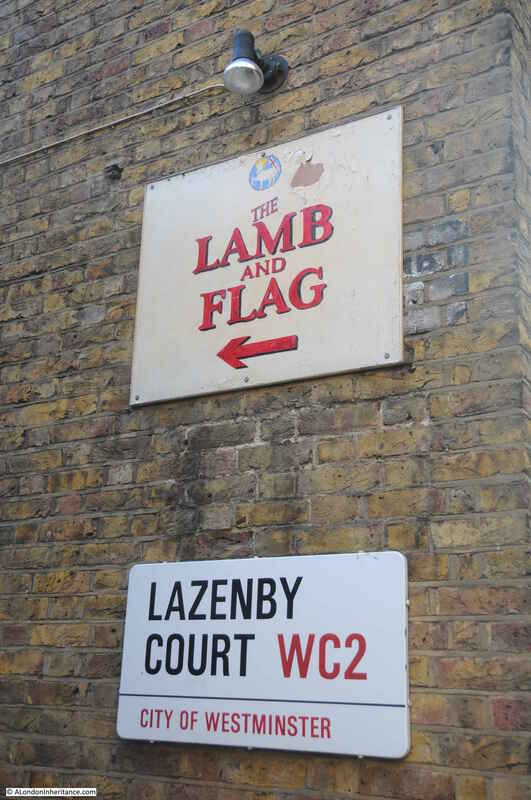 The Lamb and Flag occupies one of London’s older buildings. It was originally built at the same time as Rose Street in 1623 and much of the original timber frame survives although the front was rebuilt in 1958 as can be seen in the above two photos. The 1958 rebuild of the front of the pub lost many of the original architectural features including what appears to be a parapet running the width of the building at the top of the wall. The pub has a historic interior, unfortunately it was a bit too crowded for photos at the time of my visit. 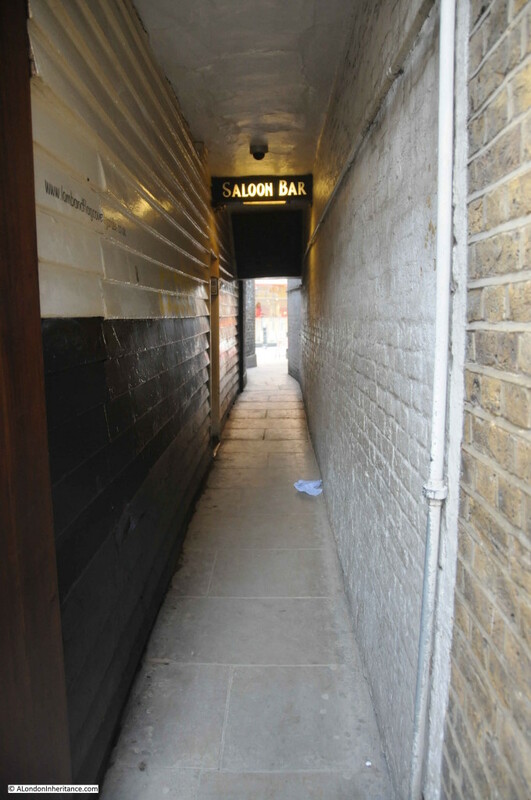 To the right of the pub is an alleyway with a side entrance to the Saloon Bar. 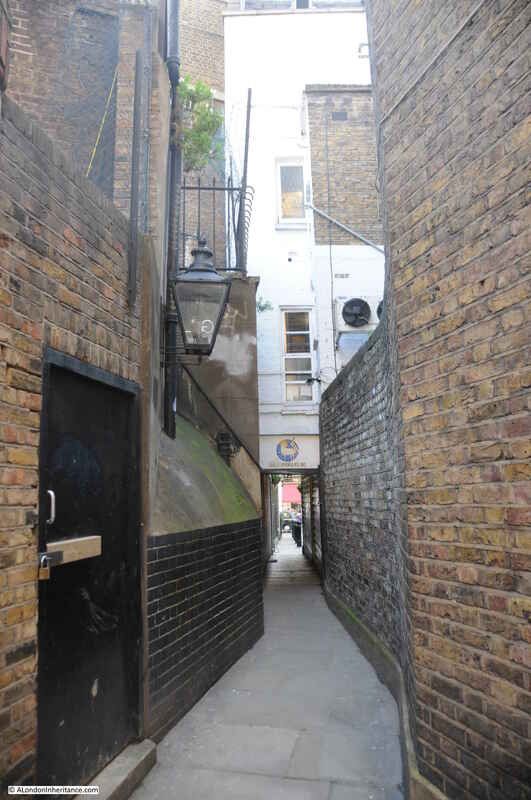 The alleyway leads through to Lazenby Court. Halfway along the alleyway, the height of the ceiling drops and at this point is a plaque that records some of the history of the pub and the immediate area. 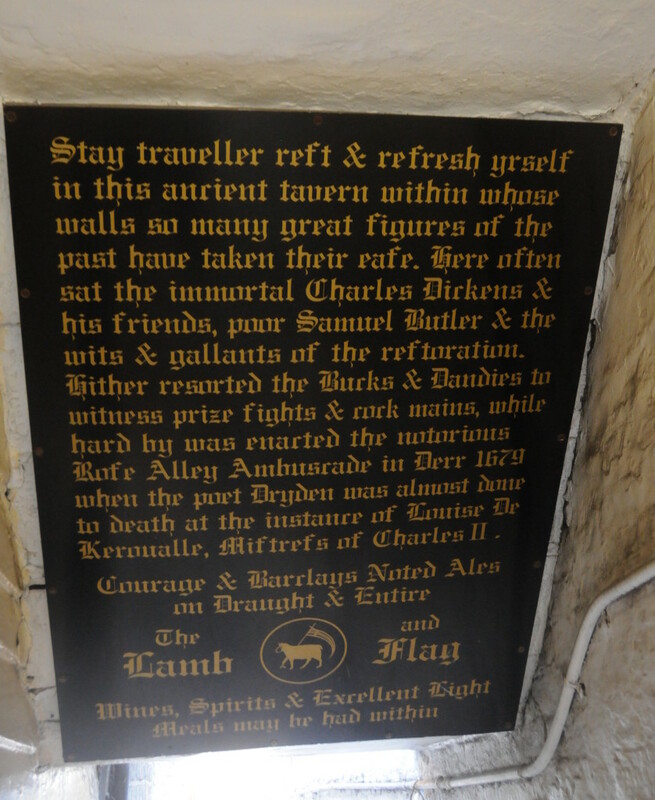 The plaque looks very new, however the reference to Courage and Barclays beers rather than those of Fullers, the current brewery, indicates an older source for the text. The plaque makes reference to Charles Dickens as well as one Samuel Butler. Butler died in a house on Rose Street and is buried nearby at St. Paul’s, Covent Garden. He was a royalist during the English Civil War and at the restoration had a number of posts with other royalists who held key positions close to Charles II. Butler wrote “Hudibras”, a popular satirical poem directed mainly against religious sectarianism and due to his Royalist sympathies focused on the Roundheads and Puritans. The plaque also records the attack on the poet John Dryden in 1679 “at the instance of Louise de Keroualle, Mistress of Charles II” for allegedly having written some scurrilous verses about her. Louise de Keroualle was unpopular in London for being both French and a Catholic, so may not have been the real culprit and an alternative person responsible for the attack was another alleged target of John Dryden’s writings, John Wilmot the Earl of Rochester. At the time of the attack, Rose Street was a dark and narrow alley and an ideal place to carry out such a deed. Despite Dryden depositing £50 with Child’s Bank in Fleet Street as a reward, the guilty party, responsible for the attack was never identified and a Mistress of Charles II probably sounds a better attribute to the history of the Lamb and Flag than the Earl of Rochester. Walking through the alleyway into Lazenby Court. This was probably more open than it is now, forming a small courtyard behind the pub. The source of the name Lamb and Flag has a religious basis. The “lamb” is from the Gospel of St. John: “Behold the Lamb of God, which taketh away the sins of the world” and the flag being that of St. George. The pub was also once known as the Bucket of Blood due to links with prize fighting. An older sign for Lazenby Court is partly hidden behind the direction sign for the pub. Rose Street runs from Long Acre, adjacent to the map and travel bookshop, Stanfords, down to Garrick Street, however today, it is cut in half by Floral Street. As with many London streets, it has changed over the years. 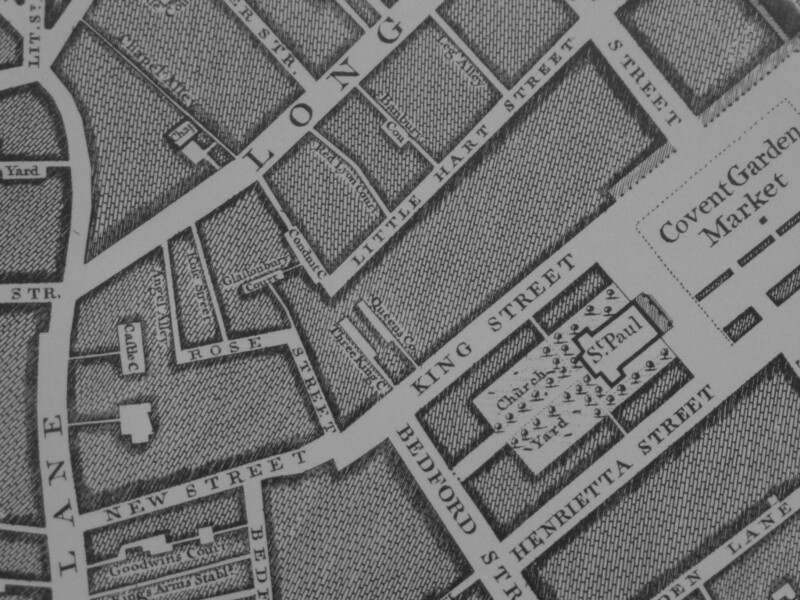 The following extract from John Rocque’s survey of London from 1746, shows Rose Street, with the alley running up from where the street bends to the left, in exactly the same position as the alley of today, however in 1746 it led to Glastonbury Court rather than today’s Lazenby Court. A very narrow Rose Street runs up to Long Acre. To the right of Rose Street is Little Hart Street. Today, this street has been renamed Floral Street and extended just past the end of Rose Street where it meets Garrick Street, a street also not yet built in 1746 which cuts diagonally from the junction of Long Acre and St. Martins Lane (the street on the left with just the word Lane showing) down to King Street. As far as I can tell from checking maps, the part of Rose Street leading up to Angel Alley, along with Angel Alley was lost when Little Hart Street was extended and renamed Floral Street. 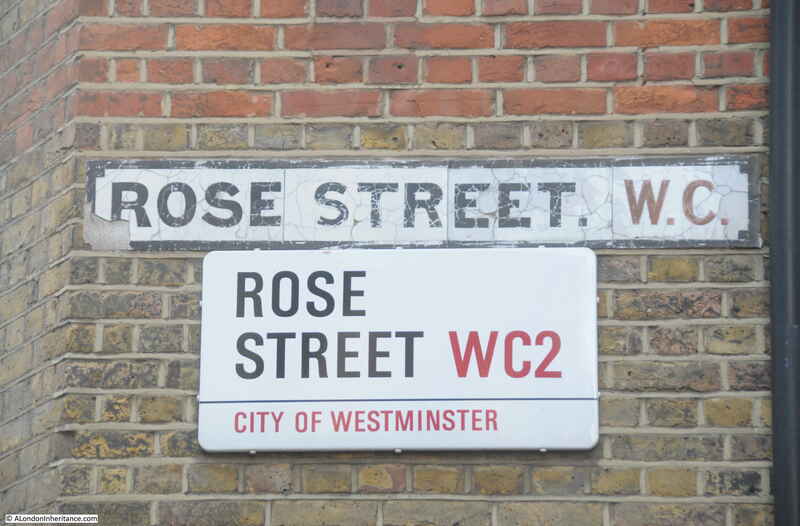 Older sign for Rose Street above the modern name sign. 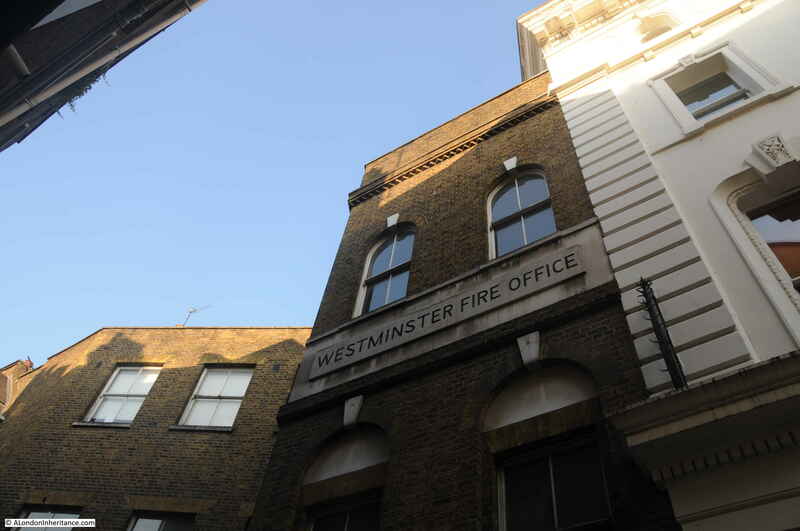 In Rose Street, just in front and to the right of the Lamb and Flag is the Westminster Fire Office, one of the original fire insurance companies who also ran a private fire fighting service. The door to the building records key dates for the Westminster Fire Office. 1717 was the founding year of the company. 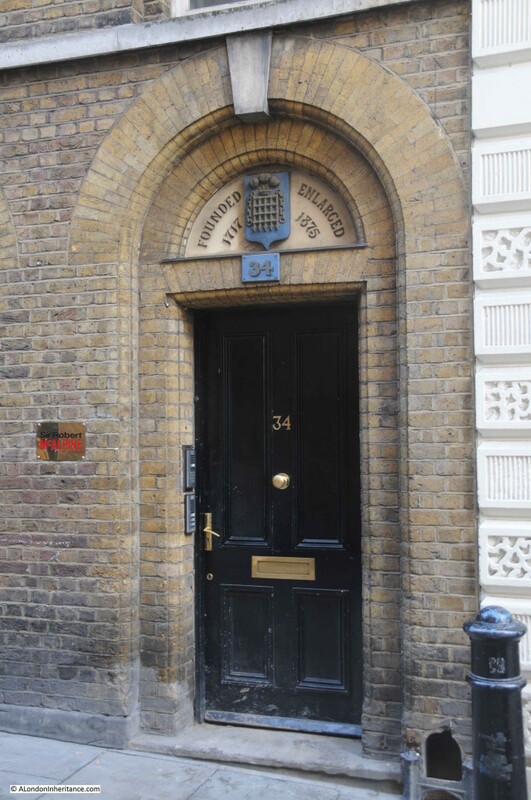 Offices were originally based in nearby King Street, but as the company grew more space was needed and in 1875 the company expanded into the building in Rose Street. 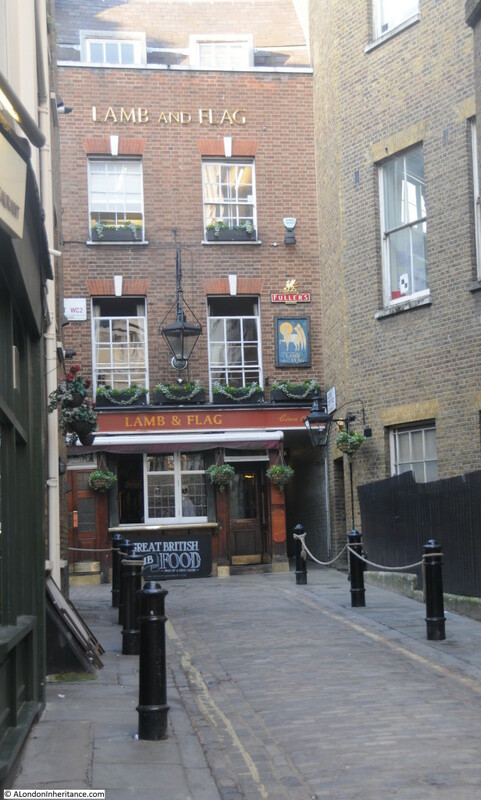 The Lamb and Flag pub is a fascinating historic pub close by Covent Garden and Rose Street is an original street from the development of this part of London. They are both well worth a visit. This entry was posted in London Pubs, London Streets and tagged Lamb and Flag, Rose Street on November 8, 2015 by admin. Another most informative post,Admin. By coincidence,The Londonist had an article just last week,on hidden London. A photograph of the brick wall opposite the Lamb and Flag has carved into it the name of the mid Victorian landlady, Emma Bowden. I think I’ll have to go and see for myself. Keep up the good work! Thanks Jo. Yes, I recommend a visit to the area and the pub is well worth a stop as well. Illuminatingly contrasted photos and richly detailed article. It’s been over a couple of decades since I used to enjoy exploring the Covent Garden area with walks/talks with the City Lit. Reading this has stimulated interest into heading in that direction again. Much appreciation. Thanks Jayne. I recommend a return visit. A fascinating area although it does get very busy at time with the tourist draw of Covent Garden. Reading this, I get homesick pangs for the London I knew – great to see some of the bits rapacious development has not hit, obliterating our view through time to places like Rose Street. Thanks! Fascinating photos! May I reproduce your father’s photo of the Lamb and Flag in an Arthur Machen Gazetteer I am editing. I believe that he refers to this pub. I will, of course, include a credit.